Enrico Giovannini was Minister of Labour and Social Policies between April 2013 and February 2014. Previously, he was President of the Italian National Institute of Statistics“ (August 2009-April 2013) and Chief Statistician and Director of Statistics of the OECD (January 2001-July 2009). He is Professor of Economic Statistics at the University of Rome „Tor Vergata“ (Italy), member of the Council of the International Statistical Institute (ISI) and Chair of the Statistical Advisory Panel for the Human development Report of the United Nations. He has authored numerous publications and articles in the field of statistics and economics, as well as four books. 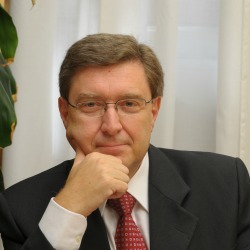 Between June 2011 and April 2013 he was Chair of the Conference of European Statisticians, a body of the United Nations Economic Commission for Europe (UNECE), and Chair of the Board of the World Bank International Comparison Programme for the measurement of purchasing power parities worldwide. As Chief Statistician and Director of the Statistics Directorate of the Organization for Economic Co-operation and Development (OECD) in Paris, he designed and implemented a thorough reform of the statistical system of the organization, established the World Forum on “Statistics, Knowledge and Policy” and launched the Global Project on the Measurement of Progress of Societies, which fostered the setting up of numerous worldwide initiatives on the issue “Beyond GDP”. He was a member of important national and international committees and commissions, including the “Stiglitz Commission”, established by the French President Nikolas Sarkozy, and Chair of the Global Council on the “Evaluation of Societal Progress” established by the World Economic Forum. For his work on the measurement of societal well-being, in 2010, he was awarded the Gold Medal of the President of the Republic of Italy by the Pio Manzù International Center and became a member of the Club of Rome. Giovannini, E. (2008) Understanding Economic Statistics. An OECD Perspective, OECD, Paris. Giovannini, E., J. Hall, A. Morrone and G. Ranuzzia (2011) Framework to Measure the Progress of Societies. In: Revue d’économie Politique, 121 Année, N. 1, Editions Alloz. Giovannini, E., R. Costanza et al (2014) Time to leave GDP behind. In: Nature, Vol. 505, January, Macmillan Publishers Limited.